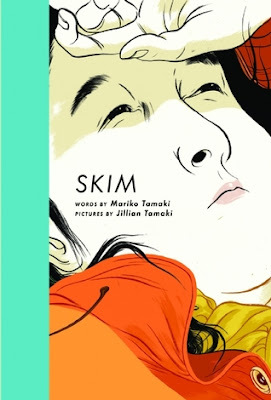 I picked up Skim without knowing what it was about. It called to me from the shelf because it was short and the drawing style was beautiful in a way I hadn’t quite seen before. Discovering it was written by a pair of cousins, the writer Mariko Tamaki and illustrator Jillian Tamaki , I was even more intrigued. Opening the book, I found a story we are all profoundly familiar with—the story of a teenage girl struggling to find who she is and what she cares about during the last years of high school. The story begins with Kim: a normal 90s student who is invisible to everyone but her best friend, Lisa. For her, life is predictable, even deplorable, until the day she sneaks behind the school for a smoke and comes face to face with her hippie English teacher, Ms. Archer. As they begin to meet every day, Kim finds herself getting closer and closer to Ms. Archer and further and further from Lisa. The world begins to shift under Kim’s feet, and all she can do is hold on to this new feeling she thinks is love. Things become even more complicated as an unexpected death rocks the school, and everyone has someone else to blame. It wasn’t hard to like this graphic novel. One of the best things about it is that the co-authors know how to pace the story. The events are everyday—mundane—but they gain a new weight when viewed through Kim’s eyes. I think the novel’s biggest strength is the collection of silent panels scattered throughout the pages. They feel like moments to breathe, to let the image transcend words. The most striking example in the entire novel is at the end of Part 1—a two-page spread of Kim’s forbidden first kiss. One image and everything came together. There’s nothing more addicting than that. If you’re dipping your toe into graphic novels and want to skip all the superheroes and magic, this one’s for you. It’s award-winning and character driven and there are a number of subtleties to sink your teeth into. It’s been a week since finishing this graphic novel, and I’m already planning on picking up the Tamaki cousins’ second graphic novel, This One Summer.